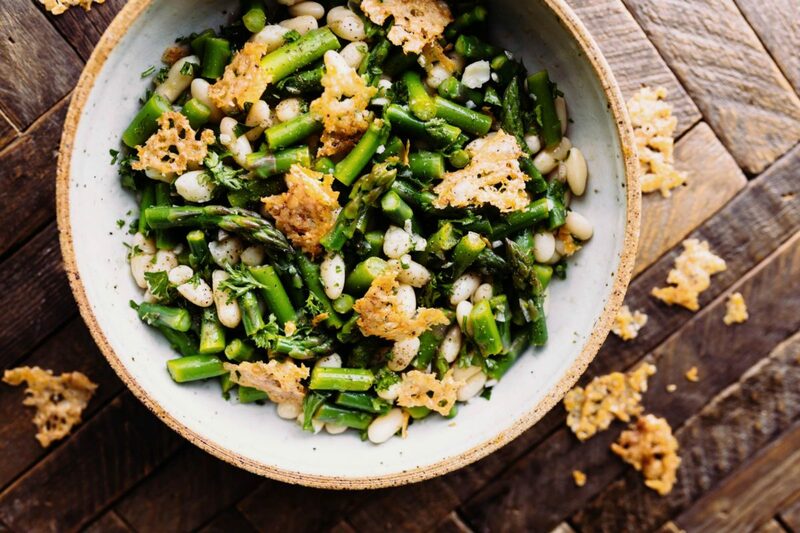 Enjoy this white bean and asparagus salad with asiago frico. Frico are oven-toasted rounds of melted cheese—aka gluten-free cheese crisps. Serve them with this springtime salad as a light lunch for two or side dish for four. For the best texture, use the thinnest asparagus spears you can find. In a serving bowl, combine the lemon juice, shallot, ¼ teaspoon salt, and olive oil and whisk to combine. Set the dressing aside. Put the cheese in a small bowl with a generous grinding of black pepper. Add the cayenne and mix well. Spoon 4 heaping mounds of cheese, 3 inches apart, onto the prepared baking sheet. Pat the mounds into 3-inch rounds (they will spread while cooking). Bake until golden brown and crisp at the edges, 6 to 8 minutes. Remove from the oven and transfer the parchment with the frico onto the counter. Let cool. Have ready a bowl of ice water. Cut the asparagus into 1/2-inch pieces. Bring a pot of well-salted water to a boil. Add the asparagus and boil until just cooked through and still bright green, about 4 minutes. Drain, pour the asparagus into the ice water to stop the cooking, and drain again. Add the asparagus, white beans, and parsley to the dressing. Toss, season with salt to taste, and serve with the frico alongside or crumbled on top.